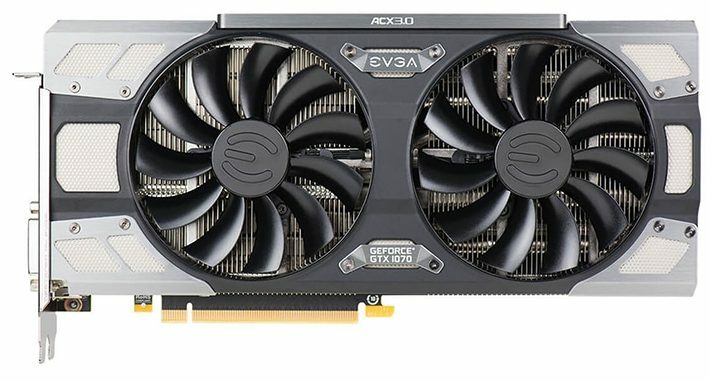 EVGA GTX 1070 FTW DT: Red-headed stepchild or red-hot deal? We must admit that we have a certain fondness for the red-headed stepchild’s of the video card industry. This is not of any love for ‘the underdog’ or anything remotely similar. Instead it is because in these hills thar be gold… or to be more precise great deals to be had on other people’s lack of knowledge. The simple fact of the matter is many of these cards got a bad rap for no other reasons than not being properly marketed. Take the example of today’s article: the EVGA GeForce GTX 1070 FTW DT. On the surface talking about ‘value’ and ‘For the Win’ series in the same sentence appears to be a contradiction in terms. EVGA’s premier series is the FTW series and the best of the best always comes with a certain amount of price premium. 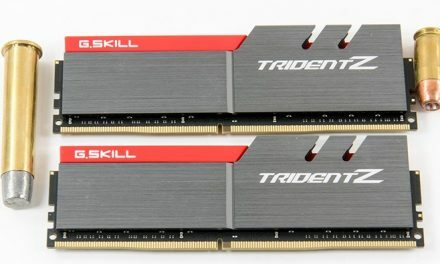 The ‘DT’ variants of the FTW on the other hand may indeed cost more at retail than their SuperClocked brethren but they do not cost as much as a ‘true’ FTW card. 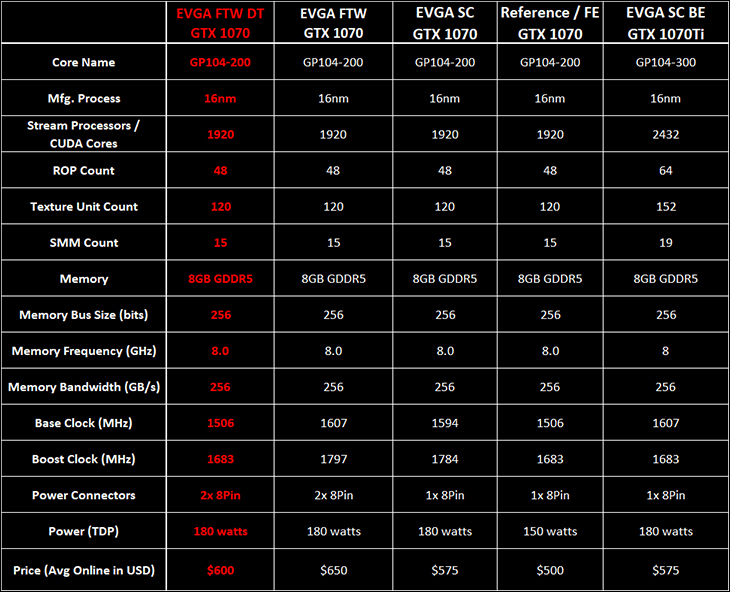 In the case of the 10-series FTW DT cards… EVGA did a rather less than optimal job explaining what the DT stood for. The DT stands for De-Tuned and for all intents and purposes they should have been called SuperClocked Plus or Reference Premium instead of being given the FTW moniker. This is why many a person accidentally bought a DT thinking they were getting a deal of a deal on an FTW, when in fact they are not FTW cards… or to be more precise they are FTW cards – with all the FTW bells whistles – but they are not rated for FTW speeds. Basically a FTW DT is a FTW card that failed the last stages of factory testing. For whatever reason they just could not meet the FTW speeds. Instead they were failed, downrated to ‘reference’ speeds and passed this incredibly low and easy benchmark. Contrary to Internet wisdom this does not mean they are ‘failures’ or ‘Dead Things’ or (the most laughable moniker we have read)… Failure to Win cards. They are instead a reference GeForce GTX 1070 GPU that is housed inside a FTW package. A 1070 GPU that was not caught until it would cost more to tear down the entire finished product and start over in a cheaper chassis… and go through even more factory testing. This means improved cooling – thanks to the more robust cooling solution that FTW cards get. This means a more robust power delivery subsystem. It even means more LEDs. 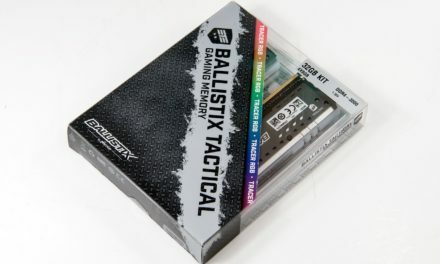 It also means that when this become available that they can be had for not much more, and in our case less than, what the SuperClocked edition goes for… as a lot of people who purchased them did not realize what the DT stood for and are selling them cheap so as to get a ‘better card’. 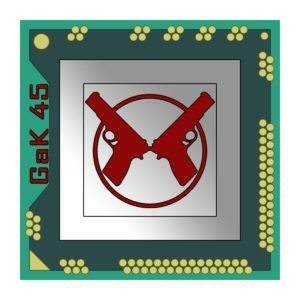 Sadly, it also means that they are not in over-abundance as EVGA’s early binning process (obviously) may not be perfect but it is pretty darn good – so they are a touch rare. 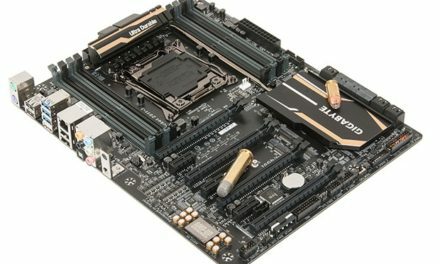 Basically, a For The Win De-Tuned is a card that at stock speeds will be much quieter than its SuperClocked and FTW brethren. It also means that these cards are tailor made for tweakers and the like who want near FTW performance but don’t want to spend the FTW price tag, but are willing to spend some time tweaking things. Put another way the DT series is the modern equivalent of the old-school Intel Celeron series that were ‘failed’ Pentiums but with some TLC (and a boat load of over-clocking) could be darn near as good as an over-clocked Pentium. This is why we like these red-headed step-child’s and why you should be looking out for one or twelve. 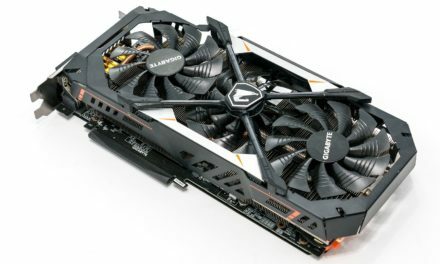 Summary While we would be hard pressed to justify the minor savings over a ‘true’ For The Win GTX 1070… at typical resale prices the value of this card skyrockets. So much so we strongly recommend keeping on the lookout for one if you are looking for a 1070 class card to add to your collection.